Upper side cowlings Refer to "GENERAL CHASSIS" on page 4-1. 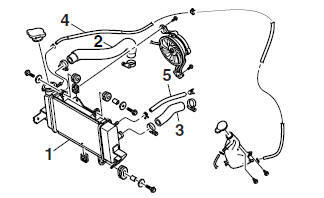 Water pump breather hose "5" Cracks/damage → Replace. Refer to "RADIATOR" on page 6-1. Side covers Refer to "GENERAL CHASSIS" on page 4-1.